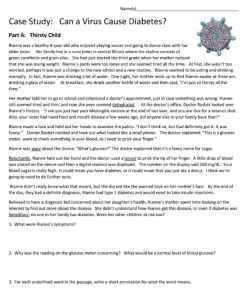 This case asks students to examine data on children diagnosed with Type 1 Diabetes after reading a short story about a young girl who was losing weight and feeling thirsty. The content looks at a possible connection between diabetes and infection by the coxsackie virus, a virus that is responsible for “hand, foot, and mouth” disease. Students must consider first how studies of human disease must be conducted, since it would be unethical to purposefully infect people. Instead, researchers use case control studies and cohort studies which examine data of individuals who have had exposure to a virus and then compare that to the number that was diagnosed with diabetes. Data analysis requires the formation of a two-by-two table that compares the exposure to the virus and the presence of the disease. The numbers can then be used to determine the odds ratio. The data is fictitious, but it is based on a peer-reviewed study from the American Diabetes Association. Though a chi-square analysis is not included in the case, you could add it to the end and ask students to dig deeper into the data. That activity was inspired by an epidemiology activity produced by the Biological Sciences Initiative. With more younger people having these issues it makes a lot of common sense.